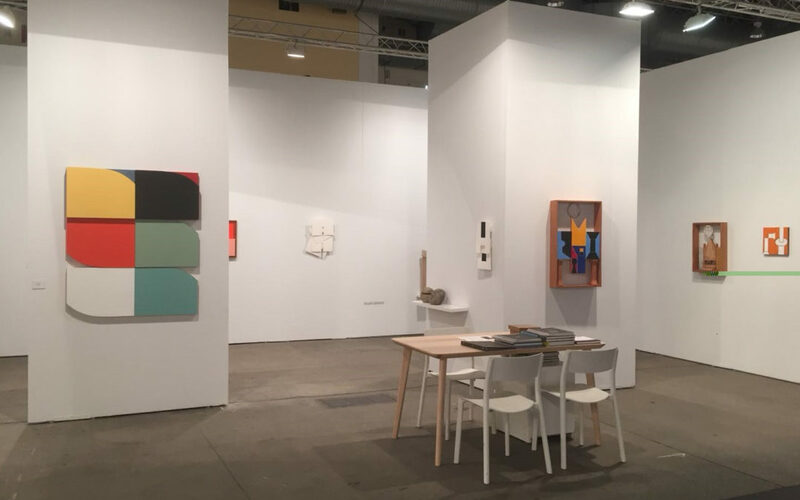 The Karla Osorio Gallery presents its participation at the EXPO Chicago, with a dialog between the vernacular geometry of the artist Galeno (Brazil) and the authentic minimalist of Roland Gebhardt (USA/Suriname). The fair will be at the Navy Pier in Chicago and the gallery is located at the booth 365, partner of Pablo’s Birthday from New York. Galeno deals with geometry and in his own way, with minimalism, in a “tropical colorful” way. One could say. He creates his own vocabulary and a new artistic language from constructivism and a geometry matrix, structured in elements from his personal roots in the interior of Brazil. Whilst, the 80-year-old Roland Gebhardt has a methodic and obsessive production. He is an “authentic minimalist” whose works, since the 70’s, deals with the void and the changing nature of volumes, just by interfering and cutting rough and organic material such as paper, stone, wood or aluminum, as well as fruits, books and vegetables. While mathematic is always present in his research, color is almost inexistent.